No harm to human health, protect your family. Great to holds your soap, shower gel, shampoo, comb etc. Adds more space for your bathroom. Scottishhighland and Islands,IV,HS,KA27-28,KWmPA20-49,PA60-78,PH17-26,PH30- 44,PH49-50,ZE, Northern Ireland, Isle of Man, Isle of Lewis,TR21-25, BT,IM,TR21-25,Republic of Ireland, Channel Islands. 6 piece bathroom accessory set. Made from high quality plastic material. Features eye catching colours that will bring character and life to any bathroom. Set includes: Tumbler, Lotion Dispenser, Bin, Soap Dish/Dispenser, Toilet Brush & Holder, Toothbrush Holder/Tumbler. Helps to keep your bathroom organised and clean. Toothbrush holder. Soap dish and lotion/soap dispenser. Toothbrush holder Toilet brush and holder. 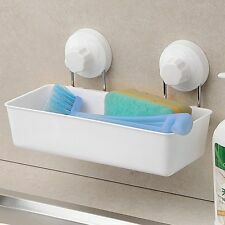 Toilet brush Toilet brush holder Lotion dispenser Soap dish. 6 pc Elite Bathroom Accessory Set Tumble Soap Tray Dispenser Trash Can Brown. Ablend ofmodern design &strong durability, thisaccessory set makes for a great addition to your bathroom. Toilet Brush & Holder. Bathroom Rug: 45 x 75cm. 100% coral velvet fabric Cushioned for softness, absorbs water quickly & fast drying. This High Quality Plastic material has stylish & hygienic wipe clean design which makes it Ideal for modern bathrooms. Adding a touch of glamour and a whole lot of practicality, the chic four piece Cristallo set will help to keep your bathroom organised and tidy. The set includes a lotion dispenser, toothbrush holder, tumbler and soap dish. Toothbrush holder. Soap dish and lotion/soap dispenser. Toilet brush and holder. Toilet brush Toilet brush holder Lotion dispenser Toothbrush holder Rinse cup and 4L waste bin. Toothbrush holder. Soap dish and lotion/soap dispenser. Toilet brush and holder. Toilet brush Toilet brush holder Lotion dispenser Rinse cup and 4L waste bin. Ideal for organising and personalising your bathroom. FREE STANDING TOILET ROLL HOLDER MIRROR FINISH CONTAINER W/LID BATHROOM ORGANIZER (SI-B1027). Freestanding toilet paper storage holder with lid. Holds up to 3 rolls of toilet tissue. Toilet Roll Storage: Yes. 6PC Bathroom Accessories Set. Toothbrush Holder. 1 X Toothbrush Holder: H11cm x 7.5cm Approx. Lotion Dispenser. Toilet Brush & Holder. 1 X Lotion Dispenser: H17cm x 7.5cm Approx. 1 X Tumbler: H10.2cm x 7.5cm Approx. Waste Bin Capacity: 4 litre waste bin that's very useful for keeping clean your bathroom. Eye catching bathroom accessories colours will bring character and life to any bathroom. 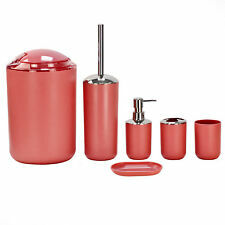 1 x SQ Professional Bathroom Accessory Set, 6-Piece, Red. 7PC PURPLE BATHROOM SET PLASTIC FLOWERS SOAP DISH BRUSH BIN TOOTHBRUSH HOLDER. Pc 7Piece Bathroom FunkyBuys® PC Piece Flower plastic Accessory Purple FLOWERS Designe Set Soap Toilet Dish Brush Dispenser Purple/ Tumbler white Bin Toothbrush - Holder Includes Bin 6Pc 3 & Litre Printed Brush Modern. 6pc Bathroom Set Waste Bin Soap. Dispenser Dish Brush Holder Accessories Brown. Toothbrush Holder Lotion dispenser Toilet Brush Holder Toilet Brush Made from high grade plastic, this bathroom set is highly hygienic. 6pc Elite Style Bathroom Accessories Set Trash Bin Soap Tray Tumbler Brown. A blend of modern design & strong durability, this accessory set makes for a great addition to your bathroom. Toilet Brush & Holder. A refreshing new change for tissue and toilet paper cases. DELUXE WALL MOUNTED STAINLESS TOILET. This Slender Toilet Roll Holder, Which Attaches. This simply designed toilet roll holder will suit any bathroom style. 6pc Elite Style Bathroom Accessories Set Trash Bin Soap Tray Tumbler Red. A blend of modern design & strong durability, this accessory set makes for a great addition to your bathroom. Toilet Brush & Holder. A blend of modern design &strong durability, this accessory set makes for a great addition to your bathroom. Toilet Brush & Holder Soap Dispenser Toothbrush Holder 1 X Toothbrush Holder : H11cm x 7.5cm Approx. Holder Fittings Screws Wall Mounted. 6pc Elite Style Bathroom Toilet Accessory Set. Ablend ofmodern design &strong durability, thisaccessory set makes for a great addition to your bathroom. The stylish and practical set is the simple way to accessorize your bathroom, while helping to keep it tidy and clutter free. Accentuating the style of your bathroom, the stylish6-piece bathroom set are ideal providing excellent storage for your essentials, while enhancing the look of your bathroom. Made using durable and smooth Plastic, the set includes a tumbler, dispenser and soap Tray, which are given a charming blue finish, adding a touch of contemporary to your bathroom. Toothbrush Holder Toilet Brush & Holder 1 X Toothbrush Holder: H11cm x 7.5cm Approx. A blend of modern design &strong durability, this accessory set makes for a great addition to your bathroom.